“Engls Honig” means “Angels Honey”. For sure it will have a heavenly taste! Not really made by angels, but equally fine by hardworking Carnica honey bees in Tyrol. Nickname “Arlberger Hochgebirgssportbienen”. And Engl refers actually to the previous beekeeper in the bee house I use. His name was Engelbert. Next to the logo, we developed a bee dance picture. 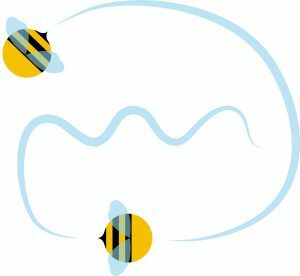 The bee dance is an intruiging way how bees communicate and orientate! The “Arlberger Hochgebirgssportbienen” know their ways around! For example into the Malfon Valley with great “Alpenrosen”.